The 212 identified Pioneers have raised a minimum of $21.2 million in hard money for Bush�s presidential effort. These 212 individuals also contributed; $2.3 million to Bush�s gubernatorial campaigns, $7.1 million in hard money to federal candidates and PACs and $4.1 million in soft money contributions to federal political party committees since the �96 election cycle. Source: Center for Responsive Politics. Contributions come from Pioneers and their immediate families. 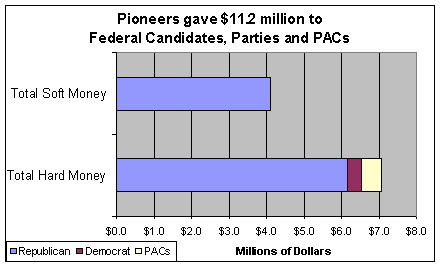 Totals do not include the at least $100,000 the Pioneers have raised (not given) for the current election. Contributions are from the 1996 election cycle to the present.